I love garage sales. Yard sales. Tag sales. Estate sales. Call them what you may, the chance to rummage through another person’s junk in search of treasure has always been a thrill for me. As a young wife and mother living on school loans while my husband completed his medical training, it was a matter of necessity. Just as God provided manna in the wilderness for the children of Israel, He used such second-hand sales to sustain our growing family throughout those lean years. I was able to clothe our children, furnish the house, build a library—all for cents on the dollar. Yet many families who would greatly benefit from some saavy second-hand shopping miss out completely, because they’ve never learned the tricks of the trade. Perhaps they’ve stopped at a sale or two in the past, but left empty-handed and quickly abandoned hope of ever doing better. If this describes you, try following the guidelines below to improve your haul and thereby discover firsthand the joys of culling through castoffs for something worth keeping. The first secret to success in any endeavor entails entreating God’s blessing upon it, and garage-saling is no exception. Pray for His direction before you ever set out: that He will lead you to the right sales, that He will help you find the items you need, that He will use these sales to help provide for your family. Have you ever noticed that when you use a list to shop for groceries, you do much better in terms of remembering to get the things you need and resisting the urge to buy stuff you don’t? The same principle holds true for garage sale shopping, as well. You will likely get much more out of the experience if you will keep at least a mental list of items you are hoping to find. I actually keep a running, written “wish list” in my notebook for such items, and read it aloud to any family members who are shopping with me, so they can keep their eyes peeled, too. The more detailed this list, the better (not just “new dress-up clothes for Joe”, but “a size 10 Spiderman costume including mask for less than two dollars”). I’ve been amazed at how often God has provided exactly what we’ve been looking for, when we’ve been looking for it, at a fraction of what it would have cost us new. Many times, these specific answers to prayer are things we’ve never seen before or since at garage sales. Whether this means combing through newspaper ads and highlighting the sales you want to hit, or simply driving a standard loop around your neighborhood, it helps to have a gameplan and to follow it consistently. Some weeks will yield better results than others, but the key is to stick with a routine. When I lived in Mesquite, there were always so many sales to pick from, I never bothered looking in the paper for garage sale ads. I’d just pick up my mom at 8 AM every Saturday morning and make a short circuit along the major roads (Motley to I-30, over to Galloway, down to I-20, then back to Motley) stopping at every sale we saw along the way, until we were back home. The entire process seldom took more than two or three hours. I prefer to shop early in the day for several reasons: First, the selection is usually better. The longer you wait, the more picked-over the sales become. Second, by shopping from 8-10 in the morning, I can be finished by the time my youngest ones wake up, get dressed, and eat breakfast (provided Dad’s available to babysit), then we have the rest of the day to enjoy together! And third, Texas summers get so HOT! By going early, I can finish my shopping in the cool of the day, which is so much more pleasant for all of us. Of course, this is purely a matter of preference. I have friends who never start garage saling until well after noon. They claim they get better bargains by going late in the day. Speaking of bargains, if you find something you like for more than you want to spend, don’t be afraid to do a little friendly haggling. Many sellers anticipate having to negotiate and buffer their prices accordingly. There’s no need to insult their goods or their prices, just say with a sincere smile, “This is a lovely piece, but would you be willing to take any less?” If you are shopping a multi-family garage sale, you’ll have to bargain piece by piece, but if all the stuff belongs to one person, you might try totaling the prices mentally and making a reasonable offer on the whole lot: “That comes to $28.50. Will you take $25 for all of it?” This strategy works especially well when you have the exact change already in hand, which brings me to my next point…. You will save yourself a lot of time and hassle by carrying plenty of cash in small denominations and change. This will also boost you ability to negotiate. Very few sellers will want to come down on their prices if doing so means accepting a check or depleting their stash of ones. It’s not a bargain if you have no use for it, so make sure you know where you’re going to put something before you pay for it. Following this simple rule will help keep your own home from looking like a garage sale waiting to happen. If the price is really good or the find is really rare, I will carry it around while I rack my brain for a good place to keep it, but if I draw a blank, I’ve learned to just leave it behind for the next shopper. (Of course, those of you who scour sales for stuff to resell on eBay can happily ignore this rule). Garage-saling with children can be a challenge, but it can also provide an invaluable training opportunity. It helps if you can shop with another adult—that way the two of you can take turns shopping if baby falls asleep in the car. When my little ones used to accompany me and my mother on our weekly garage sale excursions, I would give each child a fixed amount of money to spend however they liked (no more than a dollar each, sometimes only a quarter). This kept them from begging for something at every sale, as they knew once their money was gone, it was gone. Of course, older kids who had earned their own spending money could afford to buy more. Some of my kids enjoyed garage-saling more than others, so we’d usually only take those who wanted to shop and would leave the others at home with Dad. If a sale seemed especially promising, we’d all pile out of the car at once and shop together. If it looked like slim pickin’s, my mom and I would take turns sitting in the car with the kids while the other made a quick survey of the offerings. My final tip for shoppers is really just a reminder: Please use common courtesy. Don’t block neighbors’ driveways when parking to shop, even if you think you won’t be gone long. Don’t criticize the quality or selection or prices offered at a sale (even if your comments are well-deserved)—that’s just plain rude. Do not allow your children to run amuck, ransacking displys, toppling breakables, or scattering game and puzzle pieces. And don’t ask a seller to save something for you without leaving a non-refundable deposit. There are few things more aggravating than having to turn down multiple shoppers with money in hand who are ready and willing to buy, because you promised to save a particular item for someone who asked you to hold it for her early in the day, but failed to ever come back and actually pay for it. If you live out in the country, you will probably want to place a detailed ad in your local newspaper with a short list of items you plan to sell, hours you’ll be open, and clear directions to your house. If you live in town near a busy street or intersection, you can usually forgo the print ad in favor of a few well-placed, clearly labeled signs. I’ve gone so far as to laminate posterboard signs and staple them to wooden stakes, so that I can reuse them every time we have a sale. Each one contains the same information in bold letters on both front and back: Garage Sale. Our address. Saturday 8 AM – 12 PM. And a big arrow pointing the way. A good presentation will attract customers, so sort your stuff and display in categories on tables, if possible. We borrow folding tables from our church whenever we have a sale, but a piece of plywood laid across a couple of sawhorses will also work. Group like items together: household goods, small appliances, books, toys, decorative items and home decor, childrens clothes, videos, art supplies, tools, etc. If possible, hang your clothes, separated by size, on a rack or rod, or on a clothesline strung between two trees. Please take time to price everything in advance. Write legibly on stickers or masking tape. It is very annoying for shoppers to have to repeatedly ask for prices on items that interest them, and many of us will turn away without buying just to avoid the hassle. Don’t expect to get what you paid for things, even if they are almost new. If your goal is to get rid of excess clutter, then do everybody a favor and price your stuff at 10-20% of what it originally cost. 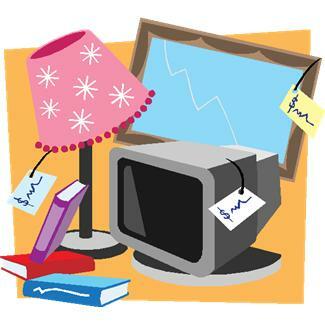 If your goal is to make as much money as you can, skip holding a garage sale at all and list your stuff on eBay or Craigslist, or sell it through a consignment store. We’ve found that staying open for more than four hours on Saturday morning yields diminishing returns. If we open at 8 in the morning, we will have usually sold the bulk of our stuff by noon. At that point, we pack up shop, take down our (reusable) signs, and cart whatever is left to Goodwill. Invariably, you will have customers who want to pay for a $2 item using a $20 bill, so be sure to have plenty of small bills and coins on hand for making change. I carry all my money in a fanny pack during the sale, bills in one compartment, rolls of quarters, nickels and dimes in another. Even if you give the cashier’s job to an older child who is quick at math, make sure they keep the money on their person. Cash boxes sometimes have a way of walking off when those in charge are distracted. Keep all doors to your house locked during your garage sale if you are not physically standing next to it, and keep close tabs on your children, as well. You cannot be too cautious these days. If you can hold your sale on a day your husband or another adult is available to help you, so much the better. As our children grew older, they became more interested in culling through their own possessions and putting things they no longer wanted in the sale. Many times, they would also fill a cardboard box with small toys and trinkets, then invite any young children who came to our sale to pick one item each for free. Not only did this help keep our littlest customers occupied while their parents shopped, but it gave my own children the pleasure of doing a good deed. As our kids grew older, they enjoyed selling lemonade or homemade cookies to customers who stopped to shop. We let them set up a small table and handle those transactions themselves. They found that cold soft drinks and bottled water sell especially well in the heat of summer. We’d buy them at loss-leader prices, put them on ice, and make a tidy profit by selling them for 50-cents a piece. This is a great business exercise for budding entrepreneurs. I love the idea of praying before you shop…I honestly have not done that before! But God cares even about the little things!